Map of major cities in Australia. 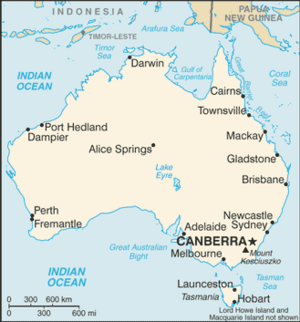 This list of Australian cities by population provides rankings of Australian cities according to various systems defined by the Australian Bureau of Statistics. Firstly, they are ranked by Greater Capital City Statistical Area (for capital cities) and Significant Urban Area (for other cities). They are also ranked by Urban Centre and by Local Government Area (known internationally as 'city proper'). Each capital city forms its own Greater Capital City Statistical Area (GCCSA), which according to the Australian Bureau of Statistics (ABS) represents a broad socioeconomic definition of each of the eight state and territory capital cities. These correspond to the more common and international usage of metropolitan areas. Significant Urban Areas are similarly defined but include population centres which are not capital cities. In Australia the population of the GCCSA/SUA is the most-often quoted figure for that city's population. The following ranks GCSSAs and SUAs which are not included within the GCCSAs with populations of over 30,000. List of cities in Australia by population Facts for Kids. Kiddle Encyclopedia.